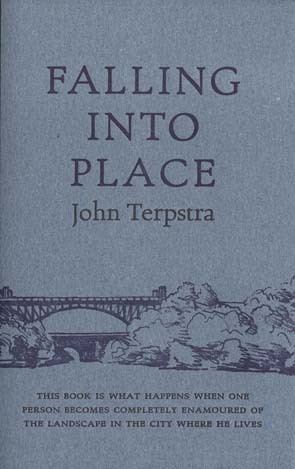 This book is what happens when one person becomes completely enamoured of the landscape in the city where he lives - especially if this person, like John Terpstra, engages the world with the imagination and curiosity of a poet. Terpstra's investigations centre around the Iroquois Bar, a giant glacial sandbar which lies beneath one of Hamilton's busiest transportation corridors. Combining history and geology with gumshoe work and poetic intuition, Terpstra puzzles out just how much the physical and social geography of the area has changed since the sandbar was formed. This close study is nested inside a broader consideration of modern society's constant and often ill-considered alteration of landscape. Terpstra's acute focus on his neighbourhood offers insights of global value in a book that is both provocative and entertaining.